In today’s workplace, the best phone is the one you have with you. The one where people can always reach you. The one that helps you get things done. For highly mobile workers, that phone is often a smartphone. 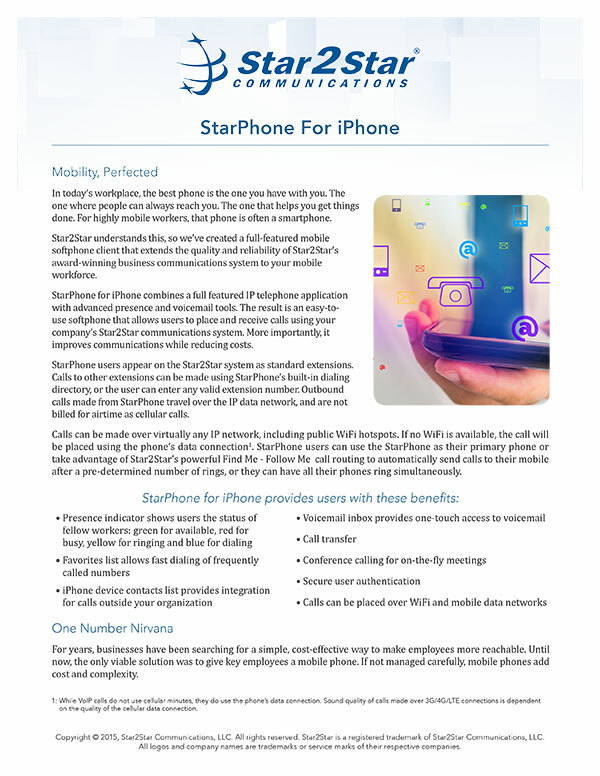 Star2Star understands this, so we’ve created a full-featured mobile softphone client that extends the quality and reliability of Star2Star’s award-winning business communications system to your mobile workforce. StarPhone users appear on the Star2Star system as standard extensions. Calls to other extensions can be made using StarPhone’s built-in dialing directory, or the user can enter any valid extension number. Outbound calls made from StarPhone travel over the IP data network, and are not billed for airtime as cellular calls.